Sensors play a crucial role in the Internet of Things, but there’s one glaring limitation: they need a battery or some other conspicuous power source to run. Soon, however, they might only have to pluck energy from the air. Wiliot has shown off a Bluetooth sensor tag that gathers energy from ambient radio frequencies, whether it’s Bluetooth, cellular or WiFi. All the ARM-based chip needs is a basic antenna printed on paper or plastic — after that, it can transmit info like weight and temperature without any kind of battery involved. The battery-free approach could lead to sticker-like tags on products where they weren’t always an option before. Clothing could warn you when you’re about to ruin your white clothing in the wash, while packaging could track products from their origins to your door. And since there’s only minimal gear involved, the tags shouldn’t add much to the cost. The tags aren’t poised to arrive until 2020. They’ll have some help getting there, though. Wiliot just finished a round of funding that includes help from investment arms at Amazon and Samsung. Tech giants want the tech to succeed, and you might just see these tags in widespread use soon after they’re ready. Some homemade sleds will blow you away. Literally. One little girl in Belgorod, Russia recently had the best snow day ever thanks to her dad’s creative engineering. With the attachment of two leaf blowers, he transformed her traditional sled into a speedy (and loud) little buggy. Need an extra reach for your next smartphone camera? An Oppo model with a 10x optical zoom may be coming soon to give you just that. What’s next in the mobile photography world after the multi-lenses, selfie cameras, AI modes, and bokeh features? Reports point out to an Oppo smartphone camera with 10x optical zoom possibly in the works now. If you’re curious about that extra reach, the official announcement could be out very soon. Just two years ago, better lens and improved zoom came on top of improvements that smartphone users want to see in their devices. Smartphone makers have been working on that, and a 10x optical zoom would definitely be remarkable. Mashable reports of a January 16 event announced by Chinese smartphone maker Oppo that hints at this upcoming feature. They sniffed the news from Chinese website MyDrivers.com, which pointed out the event’s tagline, roughly translated to “Ten for the See”, hinting at the 10x optical zoom feature. They also shared a leaked patent image for an Oppo F19 with a 10x lossless zoom technology and triple cameras at the back. The reports also point out that the 10x optical zoom camera is to be expected, and was most likely built on the tech that the company unveiled last year during the Mobile World Congress in Barcelona. It featured a horizontally-positioned “periscope” lens paired with a new optical image-stabilization technology to produce a 5x optical zoom. This setup, MyDrivers, added, keeps the mobile phone thin and compact. Official info from Oppo also says that this lens module is only 5.7mm thick. Currently, the iPhone X’s 2x optical zoom and Huawei P20 Pro’s 3x optical zoom are the smartphones to beat. We are reminded that the 5x “lossless” optical zoom never really ended up in any of Oppo’s smartphones. But that could change given all the time they had since then to further develop the technology. 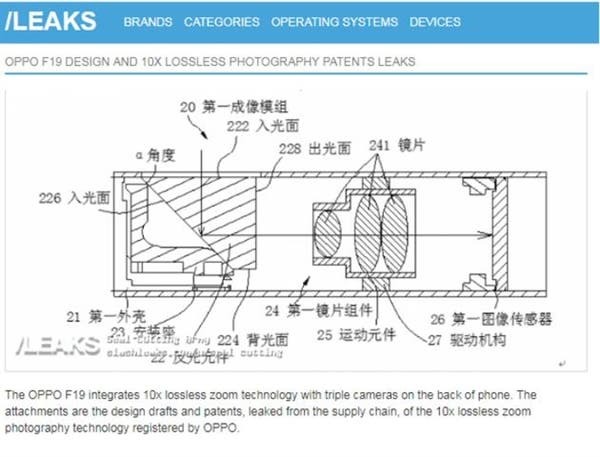 Looks like we’ll find out if this 10x optical zoom is the real deal by January 16. Can KORG take modular patching and Buchla-inspired synthesis, and squeeze it into a $200 instrument that’s still accessible to synth newcomers and experts alike? We go deep with the new $199 KORG volca modular to find out. With three analog synths (volca bass, kick, and keys), two drum machines (volca beats and sample) and an FM synth (volca fm), it was tough to guess where Korg might go in expanding this hugely successful product line. Physical modeling was an obvious choice, but West Coast modular? That’s not only unprecedented, but sounds almost physically impossible. How on earth could any company deliver full-featured modular with patch points and cables in a size barely larger than a hardcover book? When I saw the press release, I was admittedly skeptical, as most compact all-in-one modular synths forego necessities like splitters, mults, and patchable trim pots—essential for true modular work. West Coast synthesis will be new to many users, as it’s not focused on the subtractive techniques popularized by mainstream analog synths. Instead it relies on building new timbres by manipulating simple waveforms (like triangles and sines) with complex FM or AM modulation and distortion-like tools. For more depth on that distinction, you can read up on a simplified definition. 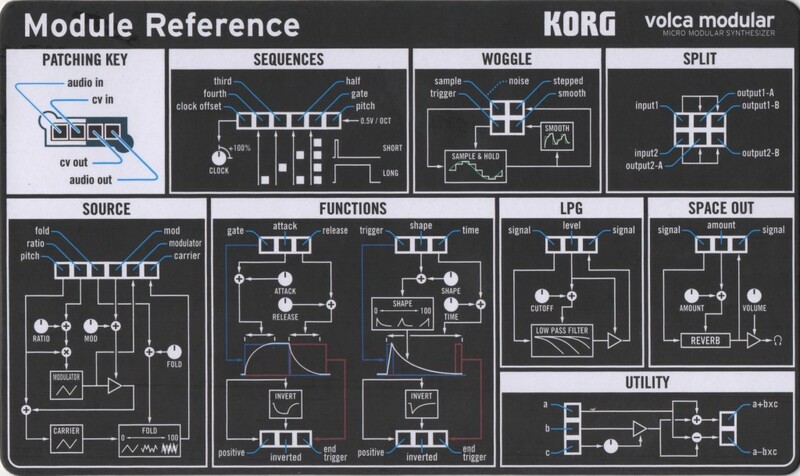 Fortunately, Korg went the extra mile and thoughtfully included a reference card with one side serving to diagram the architecture and patch points of each module and the other side including four common patch configurations as “recipes” to get you started with your own experiments. This really helps with things like creating dual-oscillator patches and adding portamento. You’re not left in the dark: right out of the box, KORG includes some recipes to get you started. I got my unit a week ago and in that time, I can confidently make this simple statement: The volca modular is groundbreaking, incredibly versatile, and worth every penny. But that’s just my endorsement as a veteran synthesist and sound designer. Here’s the reasoning behind it. It actually is an analog West Coast modular. It’s got more patch points than almost every entry-level unit out there, but packing features that will be totally new to producers who don’t already have a 168HP, two-bus Eurorack. 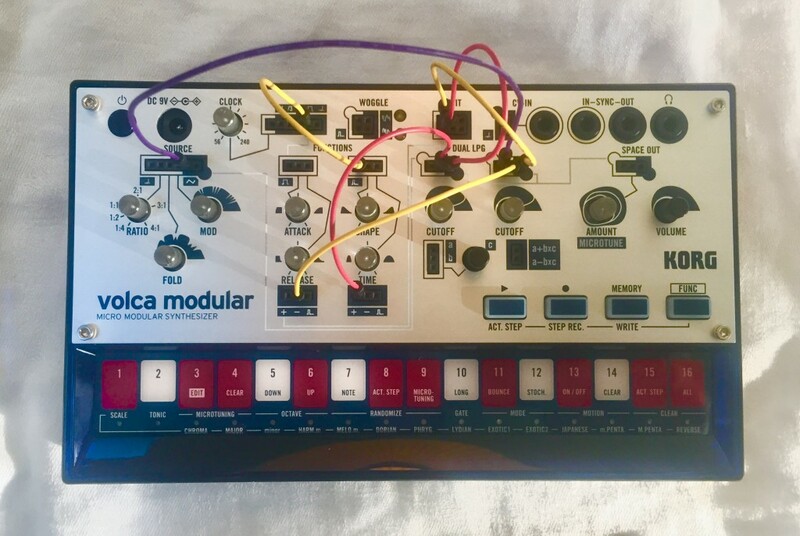 If you’re already familiar with East Coast subtractive synthesis, the volca modular feels like it originated in The Upside Down, thus instantly evoking curiosity and experimentation, because unless you’re already initiated, the results can be less than intuitive. So if you’ve never worked with the West Coast methodology, you may be a little lost. But this can be a great way to shift your approach to Zen-like “beginner’s mind”. You can’t put a price on that kind of inspiration—and if you already know what you’re doing with West Coast, you’ll be blown away by the feature depth on this tiny titan. It makes sound even without patching, but it’s also easy to patch. The oscillator pair includes both FM and wavefolding via its three knobs — and the tuning encoder digitally “snaps” into the most important ratio settings, so you don’t bump into the FM walls too much. That’s something you can’t do that with a fully-analog modular. The integrated wavefolder is also quite gritty and aggressive. At zero (off), you can get chime-like FM sounds, but as you approach maximum values, it’s far more flexible than a distortion. You’ll appreciate those function generators. The dual Function Generators are quite authentic as they’re inspired by earlier Serge and Buchla gear, so West Coast aficionados will appreciate both their implementation and patchability. The first is an attack-hold-release envelope, while the second can be pressed into service as a pseudo-LFO with a single patch wire for retriggering or clocking. More on that when we go deeper. — and more “West Coast” goodness from the lowpass gates and other essential tools, too. The two lowpass gates [labeled LPG] are great for both modifying audio signals and experimenting with control voltages—and speaking of CVs, the volca modular also includes a Utility module with trim pot, as well as a mult/splitter. These are essential components of every basic modular rig and are often left off entry-level semi-modulars for some reason *cough*. Korg didn’t cut these corners, thankfully. Plus there’s a retro-sounding reverb. At the end of the chain is a strange little digital reverb that fuses elements of plates, springs, and multitaps. It livens things up nicely in that “Bebe and Louis Barron” mid-century experimental electronica manner. 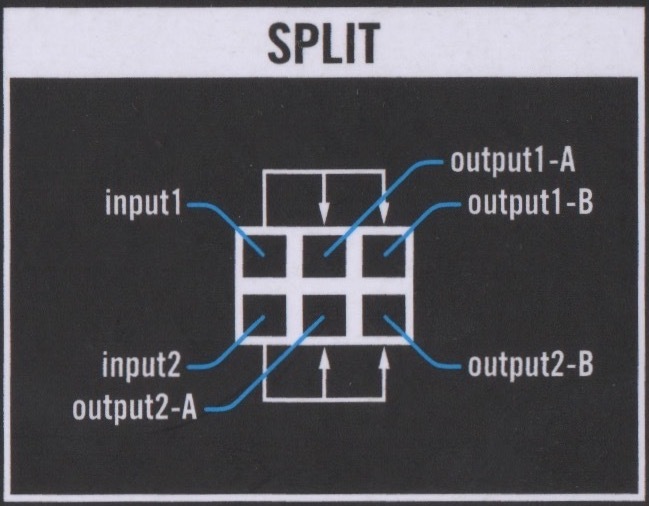 You get volca-style sequencing power, not just patching. The sequencer is the real sleeper feature on this unit. While everyone is cooing over the patchability, it’s easy to forget that the sequencer’s motion functions let you automate nearly every knob on the front panel, basically adding an LFO or step-sequencer to any parameter with minimal effort. The other sequencer functions are largely the same as the previous volcas, with additional scale/tonic features for those who are new to this “music” thing—and some microtonal scale design features for those who are completely over this “music” thing. That said, adding microtonal options is another nod to the West Coast aesthetic. That’s just skating across the synthesis features, so if you’re still on the fence about whether this will fit into your current volca rig (or studio workflow) here’s a few minutes of audio, using the factory sequences, some original patching, and a boatload of custom motion automation. 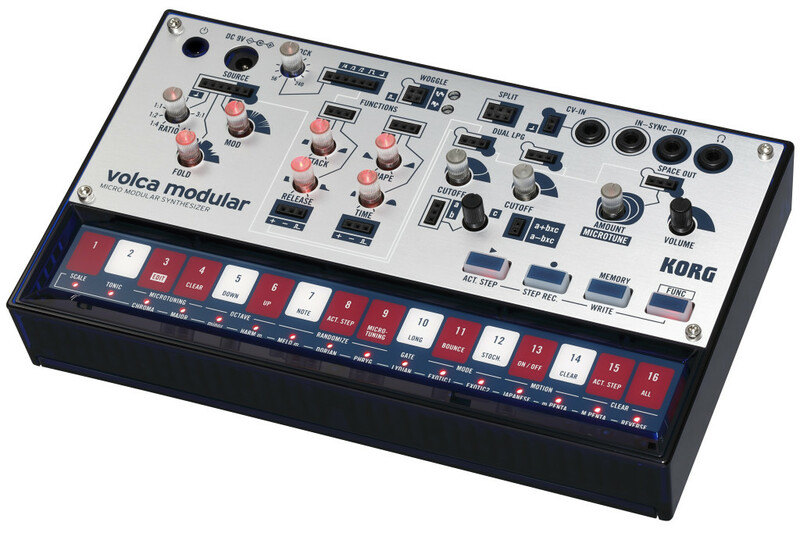 Ultimately, I think the volca modular is an extraordinary achievement both in terms of synthesis and portability. So much so that I’m ordering a few units for my school, so that I can include West Coast concepts in my synthesis courses, as well as traveling with it on my #vanlife voyages. Modular by the campfire? Hell yeah. Expert mode engaged. Still here? Good. Because I’m now going to examine each module individually and explain West Coast concepts in terms that softsynth users can easily understand. While the Volca Modular is analog—giving it a distinctly warm and chaotic character—the concepts behind manipulating West Coast tone generators could use a bit of demystification for those who are primarily familiar with sawtooths, squares, and wavetables. This is the volca modular’s primary tone generation tool, and consists of a pair of triangle waves configured in an FM carrier-modulator pair. The three parameters are modulator tuning (continually variable, with slight digital detents for common ratios like 1:1, 2:1, etc), modulator depth (FM intensity) and fold. The fold knob is a hallmark of the West Coast sound, which often starts with a simple waveform like sine or triangle, then modulates and processes it into a brighter waveform. If you want translate the folder’s behavior, it’s not a stretch to think of it as a fancy distortion. There are CV inputs for overall pitch (both oscillators), modulator pitch (ratio tuning), fold amount, and FM depth, letting you use the function generators or even the output of a lowpass gate to manipulate these functions. And this is just the starting point. In the volca’s default unpatched state, the Source audio output is routed to the first Lowpass Gate, which helps newcomers get up and running quickly. There are two function generators and each behaves in a very specific way. The first is an AHR (attack-hold-release) generator, but there’s no separate hold parameter and the release is tied to the decay, like the original Minimoog. Interestingly the attack segment is an inverse exponential curve, while the decay/release is exponential. Exponential decays are the snappiest of all and are great for transients and Kraftwerkian “thwips”. Patch-wise there are CV inputs for gate, attack, and release parameters, while the CV outs include positive, negative (inverted), and trigger outputs. Thus, there’s a CV for every aspect of the module. Impressive. In the default routing, this envelope is patched to the cutoff of the first lowpass gate, so it functions as a combo filter and amp AD envelope unless you patch it elsewhere. The second function generator is a bit trickier. A workable analogy here is to compare it to an LFO in one-shot mode (like the one in Korg’s Monologue). Here, there are two parameters: waveshape and time. Waveshape is continuously variable from an exponential downward ramp (think of it as a fast decay envelope) to a softened attack-decay envelope to a positive ramp/sawtooth (long attack, instant decay) envelope. The Time parameter controls the overall speed of both segments simultaneously—a bit like a sawtooth or triangle LFO in one-shot mode. As with the first function generator, there are CV inputs for every element, including trigger in, waveshape, and time. On the output side, you’ve got positive and inverted voltages and another trigger out when the shape completes its cycle. This is where the LFO flavor comes into play. Here are two ways to patch the second function generator for LFO effects. 1. If you want a tempo-synced LFO effect, you can route one of the clock triggers to its trigger input. 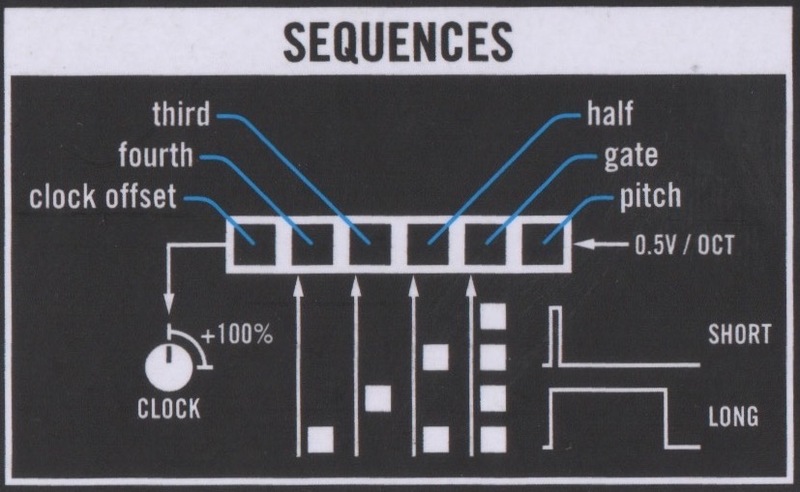 This will be the most familiar LFO effect, and the clock divisions are clearly labeled on the Volca Modular front panel. 2. If you want the function generator to independently repeat—unsynced—you can route its end trigger output back to the input trigger and create a loop, with the time parameter controlling the “LFO rate”. But the basic idea is just what the term says: a lowpass gate combines the characteristics of a filter with those of a gate. And that sets it apart from standard vanilla lowpass filters as you encounter on most synths. 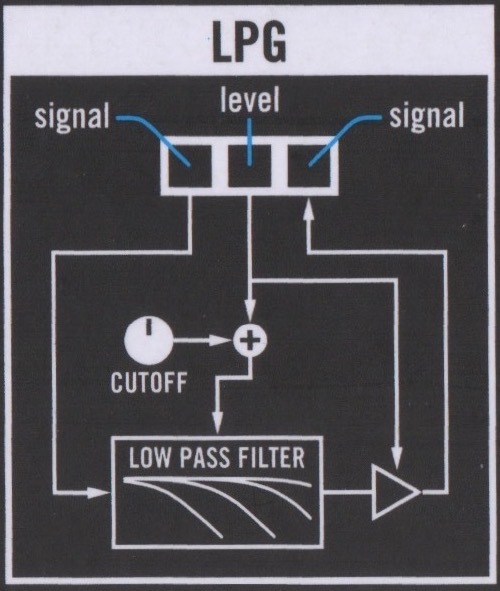 In plain terminology, a lowpass gate is just a VCA tied to a non-resonant lowpass filter with a 6 or 12dB rolloff, often based on a Sallen-Key filter (as found on the KORG MS-20, MS-10, and Arturia Brute). When you open the cutoff, you also increase the volume via the VCA. 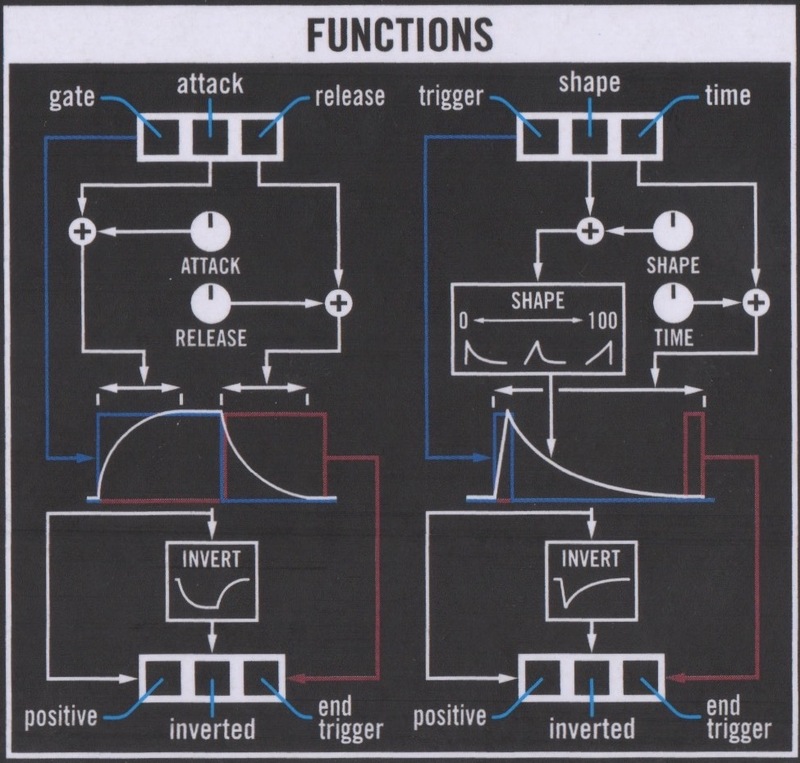 The term “lowpass gate” is associated with the Buchla synthesizer (which added it on early in synth history on the 200 series), but the basic idea of combining filters and amplitude envelopes is not unique to those instruments. 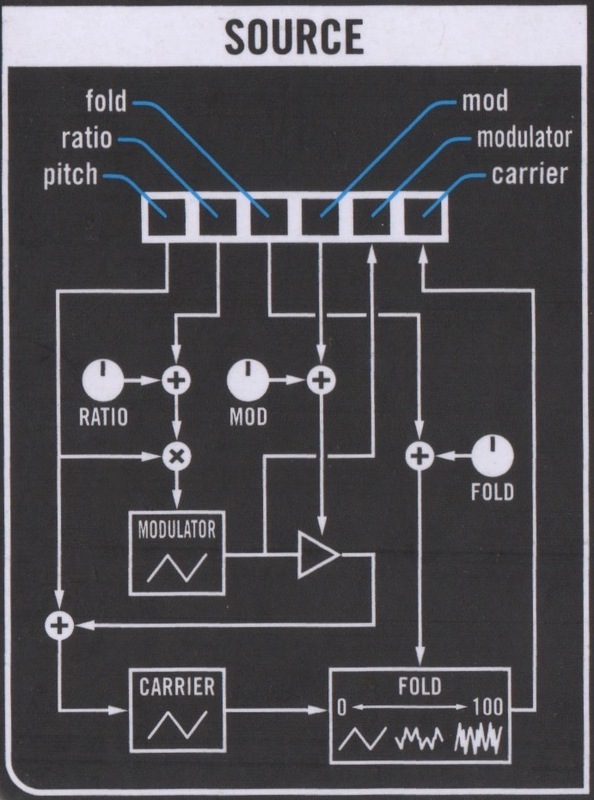 The Roland SH-101, for instance, has a filter/amp combo envelope that will work in a similar way. The specific “West Coast” flavor is then partly related to sound. In this volca, a discerning ear will pick up on the fact that at very low cutoff values, the Source triangle wave (with no folding or FM) transforms into a muted saw which gradually morphs into a triangle as you reach the upper cutoff frequencies. So while it functions much like a standard lowpass in traditional configurations, it does have a little “something extra” that makes it less predictable in some contexts. Having two LPGs opens a world of possibilities. For example, you can route the modulating oscillator into the second LPG for a dual-triangle-oscillator effect, while keeping the first LPG for processing the FM modulated carrier, then use the second function generator for an LFO effect on LPG2’s cutoff/VCA. With the sequencer on, it’s extremely complex. The Space module is a digital reverb with a lot of retro flavor. Sonically, it sounds like a hybrid room reverb, with a lot of filtered early reflections, making me suspect that there’s a multi-tap delay hiding in here somewhere. The amount knob governs both mix and decay. Some settings are short and springy, others feel a bit like a cluster of filtered delays with a longer room. But all of them have a BBC Radiophonic Workshop vibe. While the above is a primer on the individual modules, the thing that makes the volca modular fully functional is the collection of utilities that they managed to squeeze onto the front panel. I’ll be candid here, there are mass produced semi-modulars available that cost three times as much and still don’t include these essential components. Without them, it’s impossible to get a properly complex modular patch. So seeing them on this volca is a testament to Korg’s attention to detail and a real value for customers. This is the section that governs the overall tempo of your sequences, with additional outputs for clock sub-divisions. There’s also a clock offset patch point. While you can use these for anything, they’re great for triggering Function Generator 2 for tempo-synced LFO effects. Here you can split one signal into multiple outs for modulating multiple modules—or combine two signals into a single output. For example, if you want to route a Function Generator to multiple destinations, this is your go-to. I’m delighted to see this addition, as there are more expensive starter that forego it entirely. Another often omitted but utterly essential modular tool is a secondary trim pot for scaling the modulation depth of a source. It’s included in the Utility module, along with a pair of additional summing inputs that can be output as A+BxC or A-BxC. On a unit this size, it’s extraordinary. 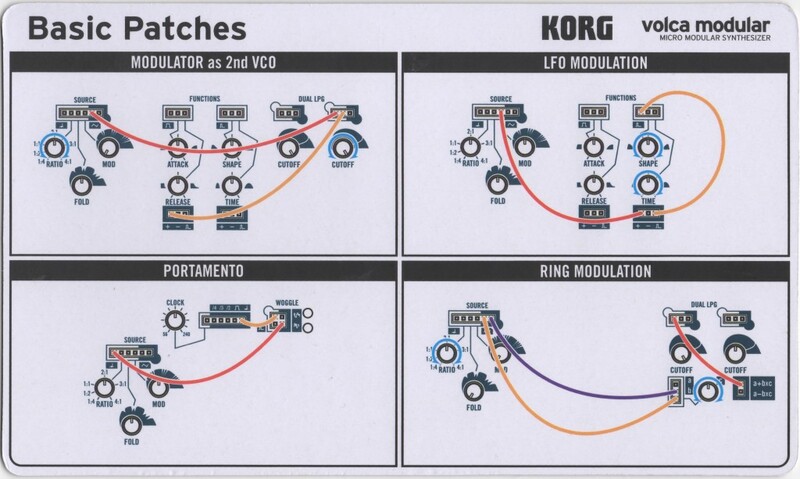 For some reason, some factions in the modular community has decided to call some sample-and-hold modules “Woggles”, so Korg opted to use that term for a nod to Wiard and Make Noise, whose Wogglebug module replicates much of the functionality of the Buchla “Source of Uncertainty” module. 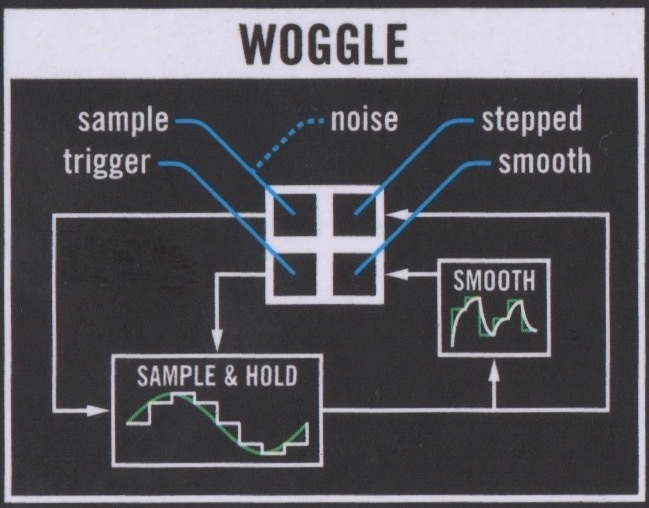 In practice, the volca’s “Woggle” module functions as a combo sample-and-hold (randomization) generator with an additional lag generator for smoothing, if desired. In this Woggle module, there are two inputs and two outputs. The “sample” input is normalled to noise when nothing is plugged in, ideal for classic “random” effects. 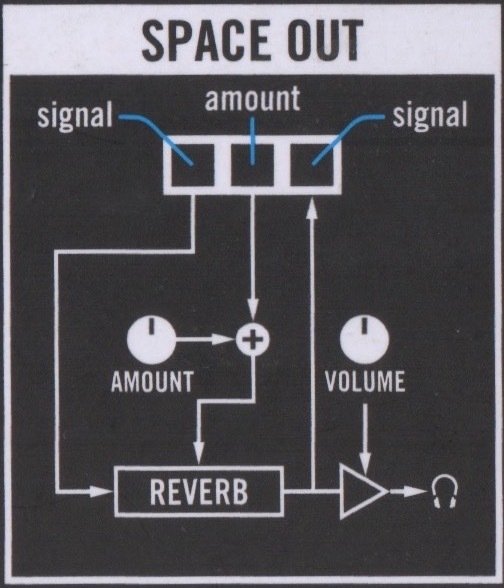 In the Woggle patch bay, you can apply an external signal (like a VCO) to override this. The second input triggers the sampling of this voltage, which is then output to both the stepped and smoothed patch points, for various randomized effects. Because the smoothed output is actually a lag generator, you can patch the output of the Volca keyboard control surface into the Woggle signal input, then run its smoothed output back to the main pitch CV input, creating glide/portamento effects. Confusing names aside, it’s another essential module with a ton of versatility. It’s mind-woggling what Korg has packed into the volca form factor. This modular will easily fit in a backpack or messenger bag, but includes nearly every essential module for dipping a big toe into the world of West Coast-inspired sound design. If you’re a volca collector, this is arguably the hippest unit Korg has released to date. And if you’re just a synth fan with looking for a way to give your rig even more analog flavor, the price point is absolutely irresistible. Put another way, if you bought a Eurorack for West Coast synthesis and equipped it similarly, you’d spend at least three times as much as this unit. I’m fairly certain the volca modular will be backordered for a while, so order it now. Francis Preve’s site covers his professional background in detail, from sound design to writing to production and teaching – plus unique projects like his Scapes environmental sounds. Visit https://www.francispreve.com/. The post Review: volca modular takes on creative synthesis in a small package appeared first on CDM Create Digital Music. All images by François Ollivier. Used with Creative Commons permission. We’re familiar with color studies and pattern experiments, but how often do we see mood studies? 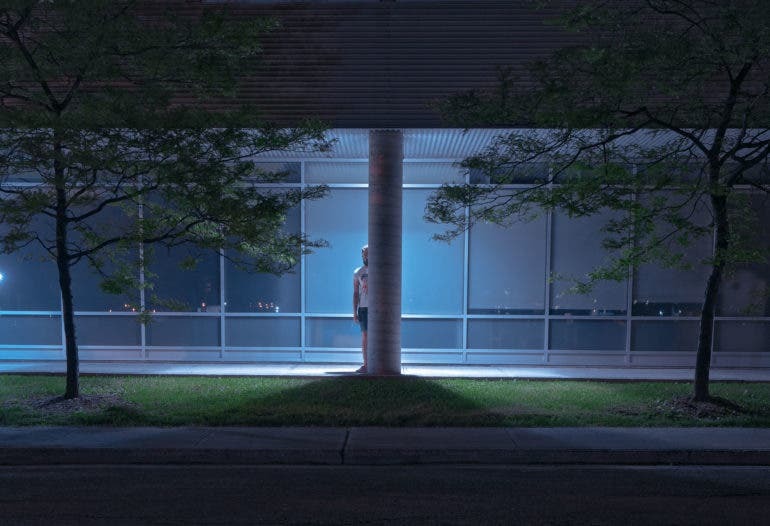 We think a collection of self-portraits shot at night by François Ollivier is precisely that: an assemblage of moods that he used either as a guide for his series, or as a way for him to immerse into the scenes he creates. If you’re thinking of doing a self-portrait project, this set could very well inspire you. Last time we checked out the portfolio of Quebec-based Ollivier, we had a great time tagging along his “weird” travel photos. Further back, we also saw his exploration into memory and the details that it sometimes fails to recreate and remind us of. 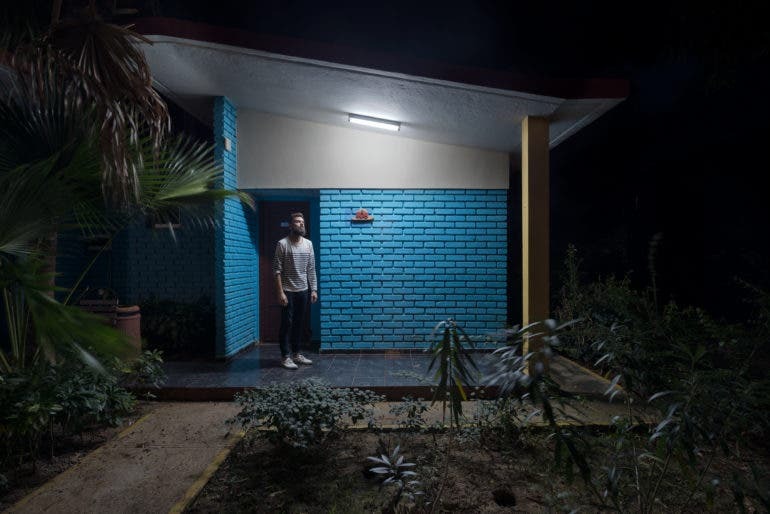 This time, we’re can look at his Self-portraits at night as a straightforward body of work which he took between 2014 to 2017. Or, we can also take notice of the different moods conveyed in each photo. There’s a cinematic touch with an obvious emphasis on colors, light, shapes, and patterns. It’s in the location, in the way the scenes were lit, and in the variety of poses he did. Each photo is like a capsule visual story telling us of Ollivier’s adventures, from the most mundane walks in lonely spaces around town, to the most intriguing and picturesque locations outside the city. All these show us the power of setting the mood. A quick prowl around his Behance portfolio reveals that these self-portraits fit into bigger visual narratives, and therefore more specific moods. There’s C’est la nuit, for example, which looks like a fun and laid-back night photo walk around the city. Journey, journée, meanwhile, gives off a mood of adventure — which is fitting as the series is actually a chronicle of “souvenirs, beauties, lights and moments” from a road trip from France to Portugal through Spain. Check out François Ollivier’s website and Behance portfolio to see the rest of his projects. Afraid a machine will take over your job? Ever thought it might take over your boss’ job instead, turning you into a servant of an AI whose inner workings you cannot comprehend? A new video short by designer and film-maker Keiichi Matsuda shows what that might look like — and how it might end. In the video, titled “Merger,” Matsuda envisions a futuristic work environment that might feel alien to us now, but a lot of it was actually based on today’s real life. In an email, Matsuda told me the interface was built around principles he’d developed in his concept UX design work for commercial clients. The four-minute video asks an important question: When (if) artificial intelligence starts giving us tasks instead of the other way around, will be able to cope with the demands? And, if not, how much will we have to change to keep up? Matsuda’s work went viral in 2016, when he published a video called Hyper-Reality, imagining a near-unbearable, AR/VR-infested future. Even though it’s now nearly three years old, that video still looks incredibly fresh and hits home better than any movie I’ve seen — and that includes expensive Hollywood productions. Check out more of Matsuda’s visual work on Instagram and Facebook.